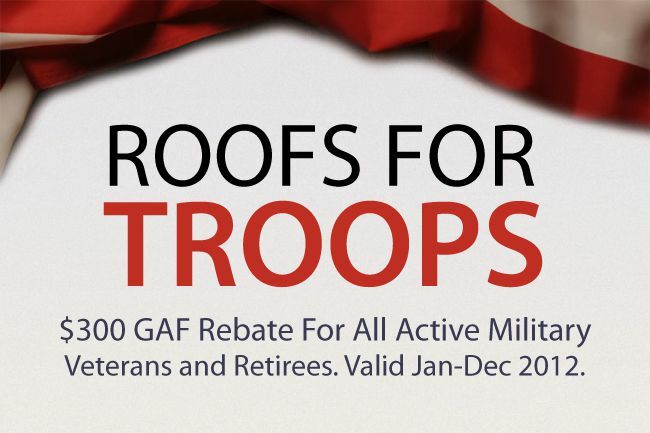 GAF, is giving a $300 rebate to all military personnel on Lifetime Roofing Systems installed by a GAF certified contractor. Roofmax is a Master Elite certified contractor which means we can pass these great savings onto America’s heros. Roofmax would like to thank our troops for their service and dedication to our country. Valid January-December 2012. Visit GAF’s website here for more details on the offer. Roofmax would be happy to install your Lifetime Roofing System and help you take advantage of GAF’s Roof for Troops rebate.